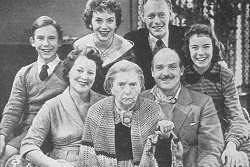 The first evening family "soap" on British television was "The Grove Family". This series, although quite popular, ran for only a relatively short time, from 1953 to 1956. Mr Grove was played by Edward Evans, and Mrs Grove by Ruth Dunning, while the irascible Grandma was Nancy Roberts (her catchphrase was "I want my tea!"). Peter Bryant was Jack, the eldest son, and Sheila Sweet played the eldest daughter, Pat. Playing the boy in the series was a young kid called Christopher Beeney who was later to make a comeback in the 1970s as a footman in ITV's "Upstairs Downstairs". But in the mid-1950s in the Grove Family he was a wild super-active naughty boy, running around the studio making the Producer's life a misery. 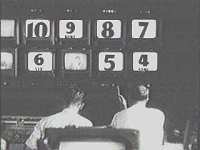 Since flying spot telecine machines had to run up to speed before the picture stabilised, all films had to start with standard leaders, and we usually started with number "10" in the gate. One producer was overheard to say "Oh I don't like using Telecine - whenever I cue Telecine, all the bloody numbers come up......"
It must have been sometime in 1954 when the complete Grieg's "Peer Gynt" was done, with Peter Ustinov as "Peer". This was the first time I'd seen two television studios being used together for one production, Studios D and E at Lime Grove. (At AP, Studios A and B had occasionally been used together for some plays in earlier years). 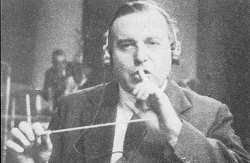 With Peer Gynt the action was in one studio and the orchestra, with its conductor Eric Robinson, in the other. 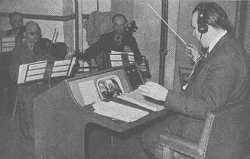 I was operating D Mechau on that occasion and remember during rehearsals Eric Robinson, who was in Studio E conducting the orchestra while listening to what was happening in Studio D via headphones, crying out in despair "How do you expect me to get the orchestra to finish on cue, when the end credits keep rolling at a different speed each time.....". I remember that also in the cast was Erik Chitty all made up with whiskers as the "Mountain King".